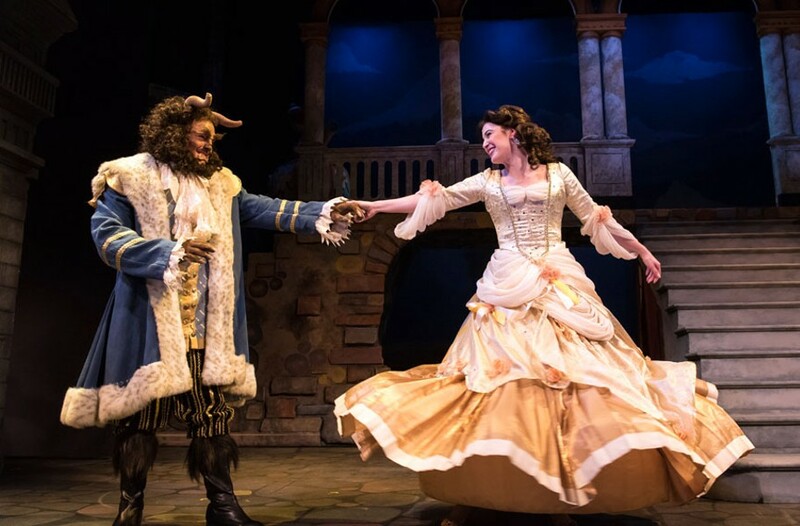 Theater Review: Virginia Rep’s Take on "Beauty and the Beast" is Downright Charming | Theater | Style Weekly - Richmond, VA local news, arts, and events. Aaron Sutten Matt Polson as the Beast and Chauncey Trask as Belle in Virginia Rep’s “Disney’s Beauty and the Beast,” which hasn’t lost its well-honed appeal. Between 1989 and 1999, Disney’s animated films received such commercial and critical success that this time has become known as the Disney renaissance. Beginning with “The Little Mermaid” and ending with “Tarzan,” Disney was untouchable, treating each movie as a full-blown animated musical. Based on a French fairy tale — and pulling ideas from Jean Cocteau’s 1946 film of the same name — “Beauty and the Beast” was soon adapted for Broadway, and is currently enjoying success as a live-action film starring Emma Watson as Belle. With so many retellings of the same story, you’d think public interest would eventually wane. Instead, Virginia Repertory Theatre’s recent mounting of the stage version only further proves the endless appeal of this tale. The setting is 18th century France, a time when enchantresses apparently roamed the countryside in search of people to curse. When a young prince runs afoul of one of these witches, he’s turned into a beast and his servants into anthropomorphic household items. The only way to break the spell is for the Beast (Matt Polson) to find love before his 21st birthday. The Beast gets his chance when a bookish young girl named Belle (Chauncey Trask) exchanges places with her father as the Beast’s prisoner, and without any hint of Stockholm syndrome, begins to fall for him. Staged as part of Virginia Rep’s children’s season, this “Beast” is downright charming, from the spoken prologue using the late Terry Snyder’s puppets, through the final reprise of the title theme. As Belle, Trask winningly manages the spunky and sweet-voiced protagonist without drifting into the saccharine. As her hirsute counterpart, Polson plays the Beast more for laughs than actual menace. Reprising some of the dashing presence he brought to Gomez in Virginia Commonwealth University’s “The Addams Family” earlier this season, Timothy A. FitzGerald wows as Lumiere the candlestick, playing well off Happy Mahaney’s tightly-wound clock Cogsworth. As Gaston, the ur-bro, Landon Nagel brings enough charisma and swagger that you can forgive him that he’s not really a singer. Virginia Rep reuses the set design (Joel Sherry) and costumes (Snyder) from its 2006 staging, and while perfectly adequate — and Belle’s ball gown is a standout — it also highlights how far the company’s stagecraft has come in the past decade. That said, director and choreographer Robin Arthur, who also directed the 2006 production, and her ensemble bring a liveliness to company numbers such as “Be Our Guest,” as well as a surprising emotional punch in moments such as Georgia Rodgers Farmer’s rendition of “Beauty and the Beast” as Mrs. Potts. Virginia Repertory Theatre’s “Disney’s Beauty and the Beast” plays through May 14 at the November Theatre, 114 W. Broad St. For information, visit va-rep.org or call 282-2620.